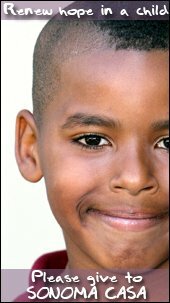 “The arduous journey of the foster child”- Part 1 of 3. 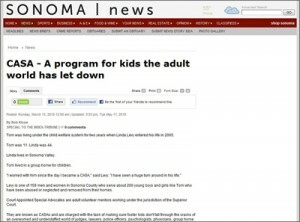 Written by Jamie Ballard (Sonoma-Index Tribune Intern). Click on the image above or here to see the full article. Or open the PDF version. 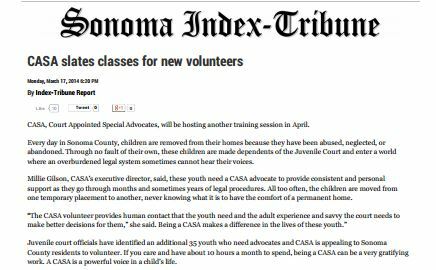 CASA of Sonoma County Named a “2013 Top-Rated Nonprofit” by Great Nonprofits. 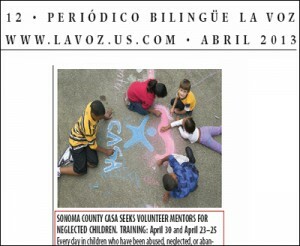 CASA of Sonoma County’s Spring Training 2013 for CASA Volunteers was featured in La Voz, a local bilingual newspaper. 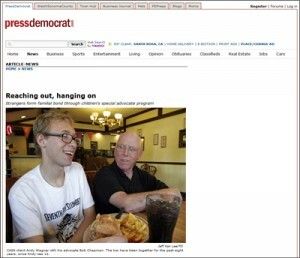 Click on the image or here to see the article. “Reaching out, hanging on. Strangers form familial bond through children’s special advocate program. CASA client Andy Wagner with his advocate Bob Chapman. The two have been together for the past eight years, since Andy was 12.” By Julie Johnson. Show ID: 1512; The following video is a 1:00 min 29 second excerpt of the full episode. For transcripts for this episode please call: 1 (866) 437-7445 or visit this page.